Maritime Arctic Competence Center inaugurated on 16 October 2018 at the premises of the Admiral Makarov State University of Maritime and Inland Shipping in Saint-Petersburg, says IAA PortNews correspondednt. The ceremony was attended by Yury Tsvetkov, Deputy Minister of Transport of the Russian Federation – head of Rosmorrechflot (Federal Marine and River Transport Agency); Mikhail Kucheryavy, Vice Governor of Saint-Petersburg; Vyacheslav Ruksha, Deputy General Director of Rosatom – head of the Northern Sea Route Directorate; Mustafa Kashka, Acting Director of FSUE Atomflot; Sergey Baryshnikov, Rector of Admiral Makarov State University of Maritime and Inland Shipping; etc. The Center established by the initiative and with participation of FSUE Atomflot (part of Rosatom Corporation) is Russia’s first maritime educational establishment intended for training, upgrading, support of professional competence and regular re-training of personnel for the fleet of nuclear-powered icebreakers of new generation. “The Ministry of Transport of the Russian Federation supports the initiators of Maritime Arctic Competence Center – Admiral Makarov State University of Maritime and Inland Shipping and FSUE Atomflot, - said Yury Tsvetkov, Deputy Minister of Transport of the Russian Federation – head of Rosmorrechflot. – The purpose of the Center is expressed by its name. Arctic competence is a unique achievement and a competitive advantage of Russian maritime fleet. It is a combination of expertise and best practices based on application of the most advanced technologies, which is essential in the XXI century for successful and efficient development of the Russian Arctic and its key lifeline – the Northern Sea Route. According to Vyacheslav Ruksha, high professionalism, discipline and striving to self-development are expected from seafarers today. “Nuclear-powered icebreakers being built today have radically new power plants which will require new competence and personnel. I hope that the first icebreaker which is under construction at Baltiysky Zavod shipyard will take the sea next year. Maritime Arctic Competence Center should become an important educational platform responsible for training of crews for multi-purpose nuclear-powered icebreakers of Project 22220”, - said Vyacheslav Ruksha. The core task of the Center is to ensure training of the target group consisting of students from the anchor institutions of higher education to meet the demand of nuclear-powered fleet of icebreakers when it comes to seafaring programmes. The Center will offer training, upgrading and retraining of personnel through application of flexible proggrammes, online courses, simulator training, sideline training (in order to decrease personnel expenses and to ensure efficient employment of seafarers on new multi-purpose nuclear-powered icebreakers). 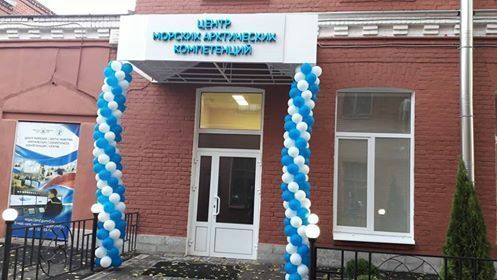 “It is no surprise that the Center opens in Saint-Petersburg at the premises of Admiral Makarov State University of Maritime and Inland Shipping as it was “Makarovka” that started training nuclear experts back in 1958. The nuclear-powered icebreaker simulator will be used for training of cadets and marine engineers as well as for training of specialists already working on icebreaking ships”, said Sergey Baryshnikov. The ceremony was followed by a tour around the Maritime Arctic Competence Center.